Is bike-sharing a pro or a con in the long run? If you’re not currently in China, you may be unaware that China is suffering from an epidemic! It’s become so bad you can’t go anywhere without seeing somone who’s caught the bug. The bike-sharing bug that is. 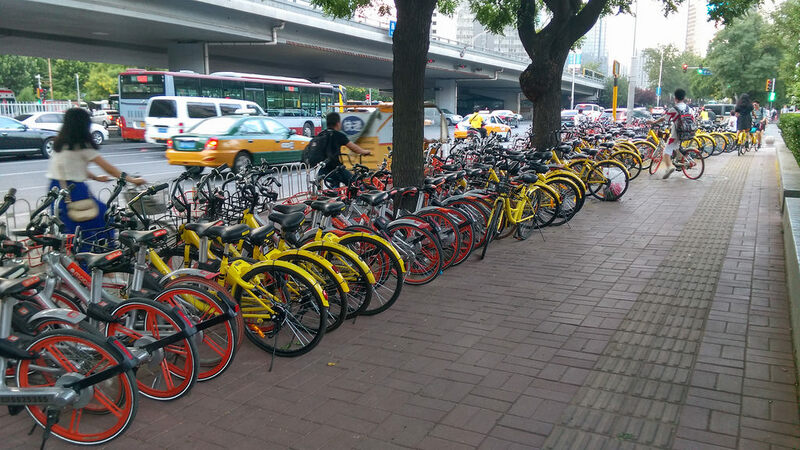 Bike-sharing in China began two years ago and has now reached epic levels of saturation in almost every major city. Most cities now have far too many bikes and they are cluttering sidewalks and polluting normally wide open spaces. Even though dockless bike-sharing is a relatively new phenomenon, there are already huge bike graveyards where damaged or old bikes go to die. The problem with these graveyards is bikes don’t exactly decay in the environmentally friendly way that humans do so they basically just keep piling up and then become an eyesore for eternity. Yet aside from the excess and recycling issues of bike-sharing, more people biking means less people driving which will reduce a huge problem for Chinese cities – pollution. It’s also good for combating another issue society is facing today – obesity. On top of that, bikes are very conveinent for us city folks. Late for an appointment but still have a twenty minute walk to the office? No problem. There’s a bike right in front of you that can get you there in 5 minutes. Feeling like getting some exercise but there are no sidewalks to walk on? No worries, grab a bike and (cautiously) bike on the road. Can’t catch a cab during rush hour? It’s fine, there’s a bike right next to you. Grab it and bike to the nearest subway station. Has the subway closed but you want to party until 3am? Just (responsibly) bike home! So how do you use these bike-sharing bikes? It’s pretty easy. Download the bike company’s app, upload your info, pay a security deposit, find one of their bikes, scan the QR code on the bike, wait for it to unlock, and you’re off! You can use the app anywhere in the country making it very handy when traveling. The best part of this “fourth generation” of bike-sharing is that the bikes are dockless, meaning once you’re done with them you leave them wherever you want; hence the clutter problem most city governments are currently dealing with. At the beginning of this bike-sharing trend in China, many bike-sharing companies popped up overnight after seeing the success of companies like Mobike and Ofo, but they were late to the party or didn’t have enough resources to endure the coming financial drought as none of these companies were making money in the beginning. The goal at first was to incentivize new users to use the bikes by offering either ridiculously low-priced or even free rides. The companies who initially raised enough capital to tide them over during this tough period are now starting to raise prices and make their money back. The top two companies are even expanding worldwide. Mobike is a bit more expat friendly, but Ofo is cheaper and requires a lower security deposit. Currently, you can bike anywhere in China for 2 hours for only 1 RMB (less than 20 cents). If you bike a lot, you can purchase monthly or annual plans to save money. In the past, bike theft was a problem for expats in China. Bike-sharing has eliminated the need to own a bike, which also means a reduction in theft. That being said, there are people who keep bikesharing bikes in their apartments, but that’s a whole other blog post. Whether the negatives of bikesharing will outshine the positives in the future, it’s too soon to tell. For the time being, get out and enjoy the ride!